Blackberry-raspberry crumble ice cream. Hazelnut-chocolate mousse with hazelnut-praline crunch. 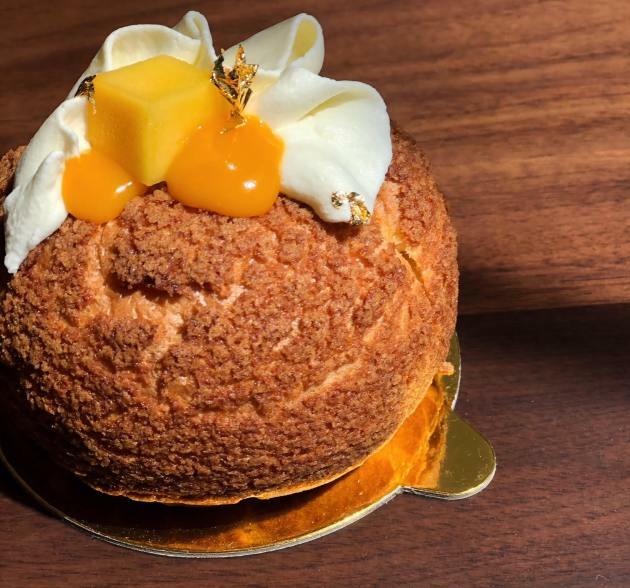 Passion fruit soufflés (pictured, above, in a provided photo). Dark chocolate tiramisu. Chinese five-spice Snickerdoodles. Got your attention? 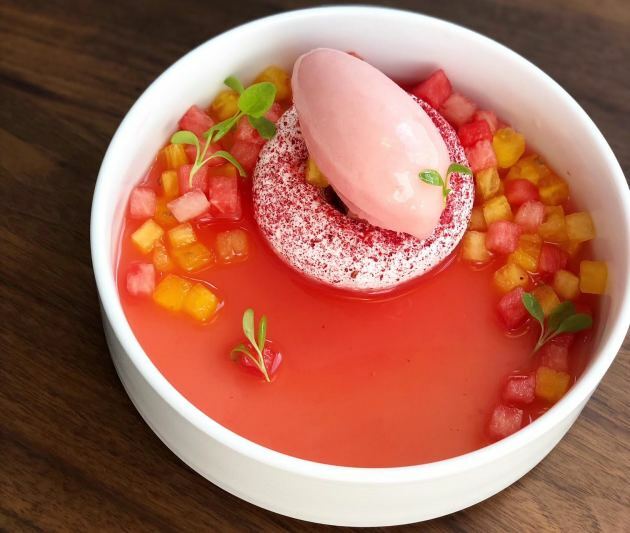 Edwards Dessert Kitchen opens Wednesday in the North Loop in Minneapolis, promising these delicacies, and more. Here are 10 must-know details. 2. What's a dessert restaurant? “We’re focusing on nighttime,” said Kaelberer. “We’re taking our inspiration from [Schwan’s] CEO Dimitrios Smyrnios, who felt the need for an evening place, for people leaving restaurants who don’t necessarily want to go home, or go to a bar. A place that’s approachable, and kid-friendly. 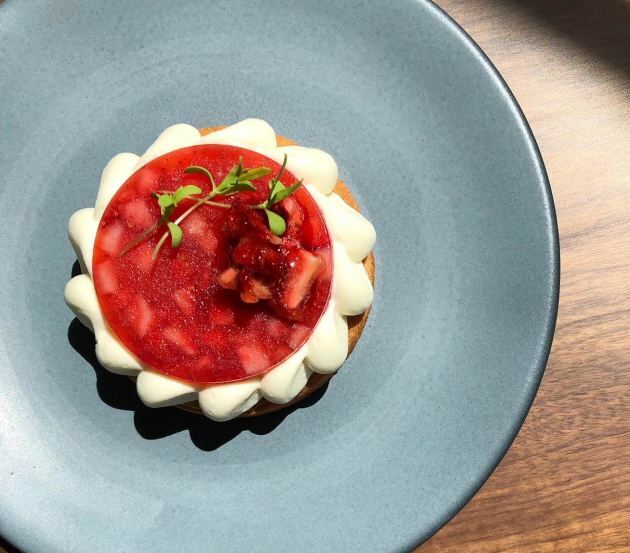 A place where people can drop in for a cookie in the afternoon, and a place where people can enjoy the whole realm of desserts.” (That's "Strawberry and Crème," pictured, above, in a provided photo). 4. Kaelberer is focusing on presenting classics in a new light. Consider a caramel pudding ($10), boosted with miso. Or a mille-feuille ($15), but one that calls upon banana chips rather than the usual paper-thin puff pastry as the layering element. Or Scotcheroo bars ($5) boosted by curry and cashew accents. “I like to take the familiar, and add something,” she said. The chocolate layer cake (pictured, above) is fairly straightforward in every aspect except its size, which can best be described as towering. “It’s kind of the ultimate chocolate cake,” she said. Picture four layers of devil’s food alternating with a dark chocolate ganache filling, a monster that’s just six inches wide but probably nine inches high. Slices ($10) are served with chocolate sauce and vanilla ice cream. 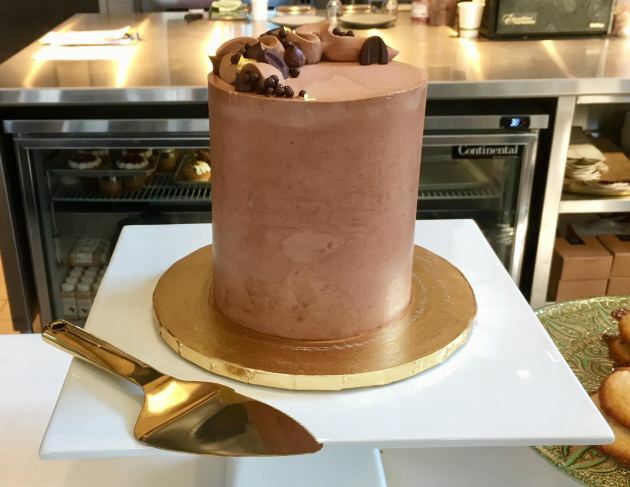 While the case is filled with tarts, verrines (layered goodies served in jar-like glasses), cookies and frozen novelties, several options (all $15) are prepared to order, including a four-dessert tasting platter and a cheese plate. 5. Ice cream has come to the North Loop. A scoop case has room for eight colorful flavors, ranging from basic chocolate (well, not “basic,” since the chocolate is a dark and ultra-premium Valrhona) and vanilla to “cinnamon toast swirl” (toasted sourdough crumbs with cinnamon) and red wine/roasted strawberry sorbet. 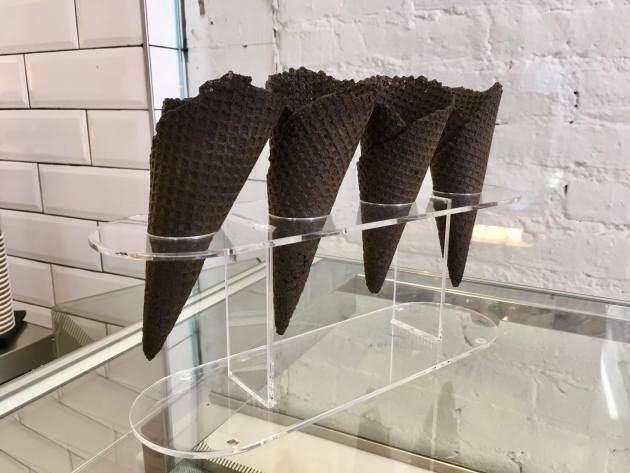 The house-made cones are darkened not with charcoal but black cocoa powder (pictured, above). There are frozen novelties, too. Pops include a semifreddo ode to the peanut butter-and-jelly sandwich (calling upon black currant jam and roasted peanuts) and a buttermilk sorbet filled with a roasted strawberry/balsamic jam is a nod to strawberry shortcake. 6. The kitchen has a savory side. A small number of menu items steer clear of dessert. One mimics the flavors of an “everything” bagel with cream cheese and smoked salmon. “Except that we’re not making bagels, because we’re not a bakery,” said Kaelberer. “We’re a dessert place.” Instead, she fills gougeres ($10) with smoked salmon (from Duluth’s Northern Waters Smokehaus) and a mousse of cream cheese, goat cheese and fines herbes; there’s a daintier version ($5) that’s served as a bar snack. 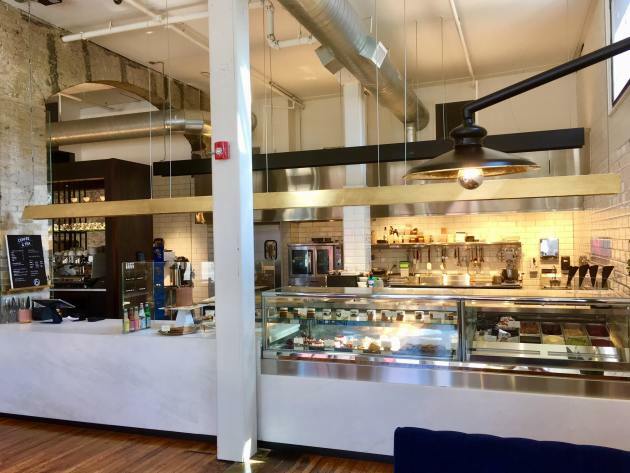 Other items include a Gruyere/smoked ham panini ($10), vegetable quiche ($10) and a sourdough rye tartine ($10) spread with a tangy Wisconsin-made sheep’s milk cheese and topped with veggies. “We hope to capture the brunch crowd,” said Kaelberer. Oh, and the bar also features what sounds like a highly addictive snack: ancho chile-dusted caramel corn ($5). 9. Yes, there are cocktails. The bar program is being overseen by the folks at Tattersall Distilling Co. in Minneapolis, with a half-dozen cocktails ($12) and 10 wines – including four sparkling options – at $12/glass and $45/bottle, plus one $8 draught chardonnay. Coffee is from St. Paul’s True Stone Coffee Roasters. 10. The restaurant is a key tenant in a historic structure that has been brought back from a precarious existence. The Italianate-style Lowry Morrison Building (pictured, above) was a brick-and-mortar investment by a pair of city fathers, Thomas Lowry and Clinton Morrison, and dates to 1879. Restaurateur John Rimarcik (the nearby Monte Carlo), has owned the property for nearly 20 years, waiting for the right opportunity to restore the 5,000 square foot, three-story structure. Although it has teetered toward derelict for decades (“When we looked at it last year, it was pretty busted,” said Kaelberer. “But every time we drove past it we said, ‘I wish we could go in there.’”), it survived, in part by virtue of its location; had it been a block or so to the east, it would have been demolished in the early 1960s as part of the Gateway urban renewal project. 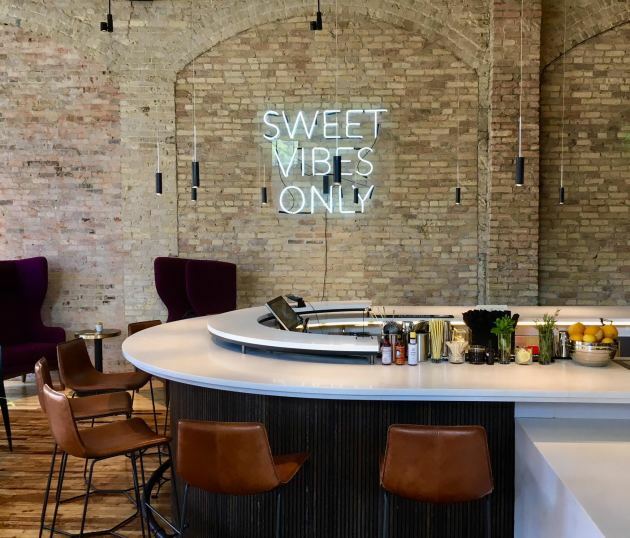 “It’s a gorgeous character building, it’s just amazing, the kind that used to be up and down Washington Avenue,” said David Shea of Shea Design, the Minneapolis firm behind the look of Edwards Dessert Kitchen. “It was going to fall into a heap in the ground, and John is about the only curmudgeon who could have saved it. 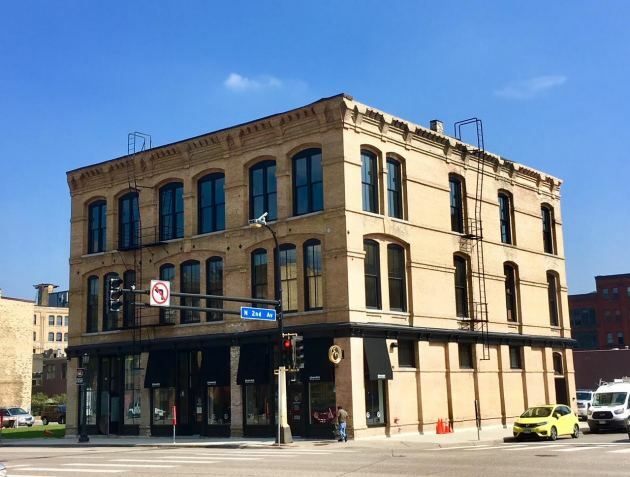 He saw there was value in it, he was patient and knew that transforming it would make a major difference on Washington Avenue.” The building’s other storefront will be occupied by InVision eyewear, and offices will lease the upper two floors. Inside, Shea & Co. have made full use of the building’s bones. Cream-colored brick, graceful arches, enormous windows and a battered but carefully restored maple floor are the backdrop for custom-designed furniture and lighting fixtures, and a sleek counter fashioned from milky Vermont Danby marble. Address book: Edwards Dessert Kitchen is located at 200 Washington Av. N. in Minneapolis, 612-800-0335. Open noon to 10 p.m. Tuesday through Thursday, noon to midnight Friday, 10 a.m. to midnight Saturday and 10 a.m. to 10 p.m. Sunday. Burger Friday: Try this under-$6 gem at new self-serve beer bar in south Mpls.